The League provides staff support for the Arizona City/County Management Association. It is a nonprofit, professional organization dedicated to increasing the knowledge and ability of city, town, and county managers, as well as other local government administrators and to strengthening the quality of local government in the state of Arizona through professional management, education, training, and the mutual exchange of information. ACMA serves as a state affiliate of the International City/County Management Association (ICMA), and will co-host the ICMA 2012 Annual Conference, along with the city of Phoenix and Maricopa County. View more information about ACMA. The League provides staff support for the Government Finance Officers Association of Arizona (GFOAz). It is a nonprofit, professional organization that serves the government finance profession in Arizona. GFOAz serves as the state chapter of the national Government Finance Officers Association. The association was founded in 1965 and has a membership of almost 300 individuals. It encourages membership from state, county, and city governments, school districts, colleges, universities, special districts, and private firms. The purpose of GFOAz is to improve the practice of governmental finance in the state of Arizona as developed and recommended by the Government Finance Officers Association of the United States and Canada as well as other recognized authorities. GFOAz provides a system of networking, training and information sharing to develop and enhance the knowledge, skills, and performance of individuals responsible for municipal and other local government fiscal policy and management. View more information about GFOAz. The Arizona City Attorneys Association (ACAA) is an affiliate group of the League of Arizona Cities and Towns. The ACAA is comprised of attorneys, assistant attorneys and deputy attorneys for the 91 cities and towns in Arizona. The Association meets twice annually to discuss municipal legal issues of importance to cities and towns throughout Arizona. Each year, the League coordinates a two day Elections Training in conjunction with the Arizona Municipal Clerks' Association. The Elections training focuses on the elections process, election issues and new election law updates. In addition to the Elections Training, the League produces the Elections Manual, a comprehensive overview of municipal elections law and procedures. View more information about AMCA. 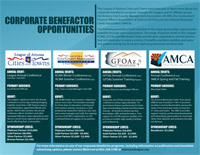 The League of Arizona Cities and Towns welcomes you to learn more about our corporate sponsorship program through the League and its affiliate groups, the Arizona City/County Management Association (ACMA), the Government Finance Officers Association of Arizona (GFOAz) and the Arizona Municipal Clerks’ Association (AMCA). The link below provides a brief overview of the many sponsorship opportunities available through each organization. The range of partner levels at the League, ACMA, GFOAz and Municipal Clerks provide your organization several options that will allow you to enjoy a variety of benefits, excellent visibility and name recognition among top local and regional government professionals.